So you go to the doctor with a patient you are convinced has some kind of eating disorder. You sit down and express your concerns. You mention FAED and ARFID and he look them up on the computer. The doctor turns to the patient, asks lots of pertinent questions and then looks at you. "Which specialist would you recommend?" "Professor Treasure at the Maudsley"
"I will write a referral letter today" (which he does!). "Anything else you are concerned about?" "The terrible eczema which responded very well to steroids last time. It is making her very uncomfortable and is not helping her sleeping." "A short course of steroids then? Why not?" There follows a "discussion" on what long term steroid use problems there are and side effects and warnings. Forward three week and the appointment at the Maudsley comes through for next Wednesday. The patient has finished her short course of steroids, which helped her appetite and her eating. A "bit of a blip" at a bridge session and she returns home. Within half an hour, the nurse from the surgery has popped round, the doctor has been on the phone and the pharmacist has popped round with a new prescription for steroids filled and ready to go. You have a bit of a heart-stopping phone call, grind teeth and then gather your thoughts. You email the doctor suggesting that the blood test he has scheduled for tomorrow incorporate this. You also suggest that the patient may not need to have yet another round of tests and scans that have so far proved negative over the last six months until we know whether this is physical or psychological. He agrees and says that he will hold off on any more physical tests (except the blood test) until the patient has seen Professor Treasure, unless it becomes an emergency. Dr Chris Castle, Cathy (aka Angel Nurse) and Mr Patel, Southwold, saviours to my mother, I salute you. You are the perfect example of what the NHS can and should do. Thank you. I have had to "edit" the film in order for it to be short enough for the F.E.A.S.T. film competition. It felt like extracting fingernails but it is done. For the longer version and all our other C&M Films, please visit this You Tube page. Labels: C and M ED Productions, eating disorders, F.E.A.S.T. It is important that the mentally ill inpatients are protected. Please join Rethink in this campaign. Livvy (on the left) and Camille (on the right) have been staying with us for the past couple of days. As you can see they are wussy Australians and need thick down skiing coats (and thick socks!) to walk the dogs on a mild (12 degrees) Autumn day. Livvy is the daughter of an ATDT mother and has come to broaden her horizons in England for a few months. She is off to Canada to teach skiing in about 5 weeks time and I shall miss her madly. She has, however, been mighty impressed by the English ATDT mums (She and Camille are staying with Rachel in Cambridge tonight) and is filled with the hope that she can catch a few more beds in Seattle and down the west coast, hopefully ending up with M in Texas. For anyone who thinks that eating disorders are a choice, incurable or we need to put palliative care protocols in place, just look at Livvy and understand the power of what parents can do and what recovery looks like - a beautiful, clever, brilliant young woman. A question from my friend, Marcella. "I have been asked to comment on the feeling of carers about palliative care and "treatment resistant anorexia". My first thought is that Anorexia Nervosa is always pretty treatment resistant but that that doesn't mean that those who suffer from it are beyond hope and actually want to suffer so, far from it. The question is how best to get round the perniciousness of the illness and treat the person. Early intervention is the holy grail, much lauded and rightly encouraged, but what about those who don't get it, or for whom it doesn't work. I would welcome your thoughts both on the question of palliative care, and on the more pertinent question (in my opinion) of how to avoid people needing it." "Individuals may have an inherent physical condition which prevents them from achieving the normal levels of performance expected from persons of comparable age, or their inability to match current levels of performance may be caused by contracting an illness. Whatever the cause, if the resulting condition is such that individuals cannot care for themselves, or may act in ways that are against their interests, those persons are vulnerable through dependency and require the protection of the state against the risks of abuse or exploitation. Hence, any agreements that were made are voidable, and a court may declare that person a ward of the state and grant power of attorney to an appointed legal guardian. In England and Wales, this is a specific function of the Court of Protection, and all matters concerning persons who have lost, or expect soon to lose, mental capacity are regulated under theMental Capacity Act 2005. This makes provision for lasting powers of attorney under which decisions about the health, welfare and financial assets of a person who has lost capacity may be dealt with in that person's interests." "Alexithymia is considered to be a personality trait that places individuals at risk for other medical and psychiatric disorders while reducing the likelihood that these individuals will respond to conventional treatments for the other conditions. Alexithymia is not classified as a mental disorder in the DSM-IV. It is a dimensional personality trait that varies in severity from person to person. a stimulus-bound, externally oriented cognitive style." "Anosognosia is a condition in which a person who suffers disability seems unaware of the existence of his or her disability. Unlikedenial, which is a psychological defence mechanism, anosognosia is rooted in physiology (for example, damage to the frontal or parietal lobe due to illness and disease). This may include unawareness of quite dramatic impairments, such as blindness or paralysis"
We need to explore at what precise level of malnutrition an INDIVIDUAL (as it differs from person to person) is still rational, in the legal sense of the word and capable of making a decision about their welfare. Many many eating disorder patients are sectioned under the Mental Health Act. Why do some patients get sectioned and are deemed "at risk", whilst others, who in the cases we are talking about, are deemed rational and capable of making a decision? Somebody, somewhere has to make their mind up about whether anorexia is a mental illness or whether it is a life-style choice. This constant shilly-shallying around the issue and the blurring of the lines about what anorexia nervosa actually IS and whether someone who is very malnourised is "in their right mind" does nothing to help the patient, the clinician or the parent/carer. What you would consider treatment resistant anorexia to be? A failure on behalf of the treatment team. How family members and carers can best be involved? "From my experience of working with carers the ideal service needs to be easy to access and quick to respond and have a clear communication system that both informs and supports all those who are caring for the person in any capacity. Services need to understand the stress caused because of living with someone who you are afraid may die". My list goes on and on: support, hope, peer-to-peer interaction, kindness, exoneration from blame, clear explanation of anorexia is AND isn't, etc etc etc. Whether it is acceptable to offer someone palliative care, keeping an individual pain free rather than offering active treatment for their condition? In my opinion, anorexia nervosa is treatable. If someone has been neglected to the point that they are needing palliative care, they have been let down. There are others who believe this is a treatable illness. There has been a lot of comments on this paper. Who am I to argue with the President of the AED? Death is a preventable outcome of eating disorders and may be secondary to lack of awareness, knowledge or timely treatment; yet it would seem that paediatric medical and mental health services are sometimes ill-equipped to meet the challenges of young patients presenting with eating disorders, especially acutely. 50% of children less than 13- years old are hospitalized early in their illness(2) and numbers of children under 14 hospitalized for eating disorders has risen over the past 10 years(HES data). A recent survey of on-call paediatric registrars in hospitals in England and Wales revealed poor knowledge of the acute management of children with eating disorders(submitted for publication). Most were unaware of the frequent cardiovascular complications and unable to outline the complications of re-feeding syndrome. Or put another way, The Fairy Blogmother's answer. I have been asked by Professor Treasure to get some patient and carer endorsements for "training and support of carers = better long term outcomes in anorexia nervosa". I know this is anecdotal but please can you all help? 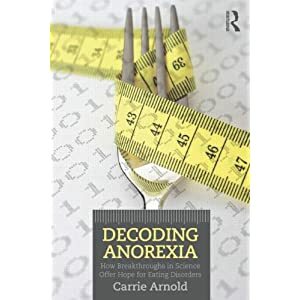 "Decoding Anorexia is the first and only book to explain anorexia nervosa from a biological point of view. Its clear, user-friendly descriptions of the genetics and neuroscience behind the disorder is paired with first person descriptions and personal narratives of what biological differences mean to sufferers. Author Carrie Arnold, a trained scientist, science writer, and past sufferer of anorexia, speaks with clinicians, researchers, parents, other family members, and sufferers about the factors that make one vulnerable to anorexia, the neurochemistry behind the call of starvation, and why it’s so hard to leave anorexia behind." I have been networking on Linked In recently. It was an exercise to promote the F.E.A.S.T conferences in 3 continents but joining Linked In is lethal for a connections enthusiast like me. There are so many good things to say about Carrie's book. It is not in the tiniest bit dry or patronising and contains many witty comments and analogies. I ADORED her brain chapter and shall never again be afraid to look at diagrams of the brain, now she has explained the parts and functions in a warm and amusing way. What struck me most, in this well-researched and factual book, was how much I already knew but was completely unable to explain to anyone. I shall be carry it around in my handbag and bore people to death by reading out long extracts at the drop of a hat. There is nothing more disappointing than someone, to whom you have been exceptionally close, managing to Keep Calm and Carry On. After an irreversible change in any close relationship, it always hurts when the "significant other" gets on with their life, without your advice, and doesn't end up wrecked, without you as their rudder. It is FINE for you to move on, but not for the other person. Don't they get how much it irritates that they have coped well (and may be even better?) without you? Don't they understand that is OK for you to move on without them, but that your ego is crushed that they can succeed without you? In these days of social media and instant communication, it is only too easy to breathlessly watch from afar, as they appear to soar and to spend hours ripping out metaphorical fingernails when comparing your smaller and more mundane experiences. However, it is worth reminding yourself that they, too, may be feeling a little sore round the fingertips that you have not yet "died of love" for them?